Democratic National Committee chairman Tom Perez insisted Sunday that his party does not have a problem of division because Democratic socialism and "moral capitalism" are compatible. 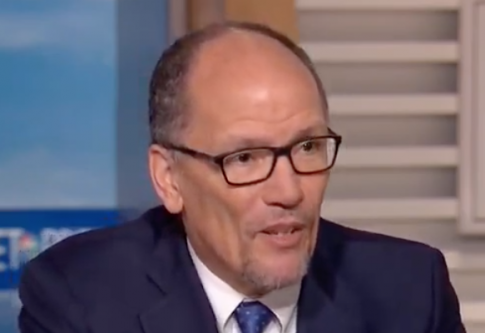 Perez appeared on "Meet the Press" and argued Democrats have the best record on job creation and the economy because they make sure "everybody succeeds" through the share prosperity of "moral capitalism." Host Chuck Todd inquired about the Democratic socialist movement, which boasts many of the most high-profile leaders on the left, such as Sen. Bernie Sanders (I., Vt.) and Rep. Alexandria Ocasio-Cortez (D., N.Y.). "Can you be a Democratic socialist and for moral capitalism?" Todd asked. "Absolutely," Perez responded, arguing former president Ronald Reagan was wrong to use the "label" of socialism to criticize Medicare. "Don't forget, when Ronald Reagan was railing against medicare in 1963 he said medicare—this is a quote—'will lead to socialized medicine and will lead to socialism in America.'" The Democratic socialists are calling for an entirely socialized healthcare system on the model of Medicare, which they call "Medicare for all." This left-wing proposal is backed by most of the Democrats running for president, but Perez didn't bring it up. He said he’s about "results" rather than labels.